Used Audi A6 Review - 2004-2011 Servicing, MPG, Insurance | What Car? 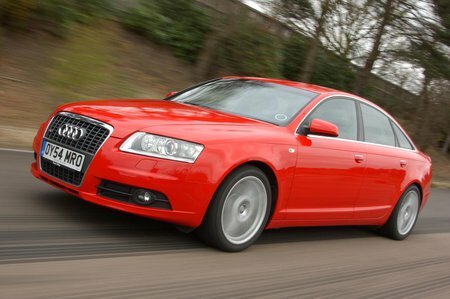 What used Audi A6 saloon will I get for my budget? How much does it cost to run a Audi A6 saloon? The 2.0-litre diesel has an official average of 44.8mpg, compared with the 2.0-litre petrol's 34.5mpg - but be sure you'll cover enough miles to make the extra cost of the diesel worth paying. The 2.7-litre diesel is respectable at 40.9mpg, with the 3.0 V6 at 35.3mpg. These beat the rest of the petrol models, with the 2.4 V6 managing just 29.1mpg. High emissions mean road tax cheap isn't cheap on any model, but a 2.0-litre TDIe diesel introduced in mid '08 is by far the cheapest to run, it emits just 139g/km of CO2 and covers 53.3mpg. Servicing costs are typical for this type of car, but there are plenty of specialist independent garages who will save money. For cars that are three years old and over Audi dealers have fixed-price servicing, along with set prices for replacing standard parts, such as brake pads, which represent decent value.